Animal Rescue in Flood and Swiftwater Incidents. 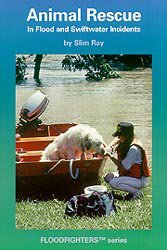 This booklet covers an often overlooked aspect of flood and swiftwater rescue; the rescue of non-human victims. Animal Rescue in Flood and Swiftwater Incidents by Slim Ray. 6X9 is 85 pages with 17 photos and 13 illustrations. Even if you feel this will never happen on your shift, it makes sense you give this book a read to avoid future injuries. Why animal rescue? To some people this will seem obvious, but if you are firefighter or other emergency services worker, it may not. "We got better things to do than rescue grandma's cat," is the often heard refrain. However, the public knows that firefighters do two things--put out fires and rescue cats from trees. So animal rescue is part of the job, at least in the public's mind, whether we like it or not. Approximately 50% of all U.S. households have a pet of some kind. Livestock losses in floods can often be measure in millions of dollars. While pet drownings are fairly rare, large numbers of cattle have perished in floods. For large, heavy, powerful animals like horses the preferred method is to get them to cooperate. For small, skittish animals like cats, restraint is the best option. As a rescuer, you need to understand enough about the animal's instincts, physical characteristics, and psychological makeup to make an intelligent decision about what your options are. Animal behavior is driven far more by instinct that is that of humans. In disasters animals follow their instincts more than what we would consider reason. Like humans, they may panic and exhibit non-purposeful behavior. For the rescuer, it is important to know how different animals react. Sometimes, animals are not aware that they need to be rescued. Dogs, for example, will often continue to defend their territory against rescuers. Domestic animals act differently when their owners are not around.